In my recent visit to Naples, in early October, I managed to visit the Sorrentino Winery, which is located on the slopes of Mt Vesuvius. Unfortunately, it was a couple of hours before my flight and after spending a good half hour going round and round in circles, thanks to my GPS, I didn't enjoy my visit as much as I would have liked, because it was rather hurried. Luckily, on the other hand, as Nikos and I arrived they were starting a tour of the vineyard, so we blended in with a group of Americans. The vineyard has a south-western exposure and reaches up to 600m above sea level, with the breath-taking Vesuvius as a back drop, and the ruins of Pompei, the city of Sorrento and Capri laying ahead in the distance. As we walked through the vineyard I was struck by the fact that it felt as if my feet couldn’t get a grip on the soil to walk. The volcanic ash, sand and lapilli turf seemed to be so light, that as the foot landed, the volcanic soil gave way. It was a cross between walking on a sandy beach and foam balls. The colour of the soil is black and ash grey. The vineyard is organic, ungrafted, since the soils act as a natural pesticide, and covers an area of 35 ha. The original property, is one acre and the vines are pergola trained, whereas the greater part of the property is Guyot trained. Between the vines they allow spontaneous growth and plant the field bean which enriches the soil with nitrogen. The soils are porous, have good drainage, are fertile and rich in minerals (phosphates, nitrates, potassium, calcium, phosphorous, iron) due to the lava flows. The harvest was already finished. There were a few bunches left here and there, which made it obvious that they had harvested selectively. The grape varieties grown in the vineyard are Caprettone, Falanghina, Catalanesca of the white, and Piedirosso, Aglianico Pompeiano of the red. We sat down to a quick lunch, and the lady in charge of our tasting very kindly asked the chef to condense the menu, so we could go faster. The dining/tasting area has glass all the way around with a lovely view to the vineyard, Pompei, Sorrento and the sea. We started out with the Lacryma Christi del Vesuvio DOC Sparkling 2016 (90% Caprettone and 10% Falanghina), made in the Charmat method. They produce the only Sparkling Lacryma Christi. Citrus fruits, green pineapple and some stone fruit, fresh acidity, slightly flinty, dry. Lovely, refreshing. 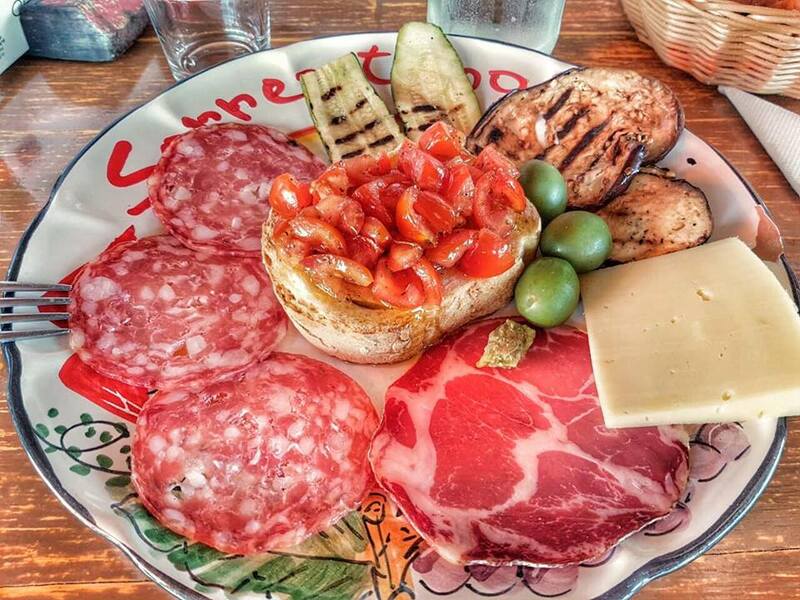 In the meantime, a beautifully served plate of salami, prosciutto, cheese, olives with grilled zucchini and eggplant arrived, the centre of which was adorned with the most beautiful bruschetta, topped with tomatini and dressed with olive oil. All the veggies and oil are grown on the farm. That was followed by a plate of Neapolitan pasta and dessert served with their own marmalade. A special note about the people who were very warm, informative and welcoming. 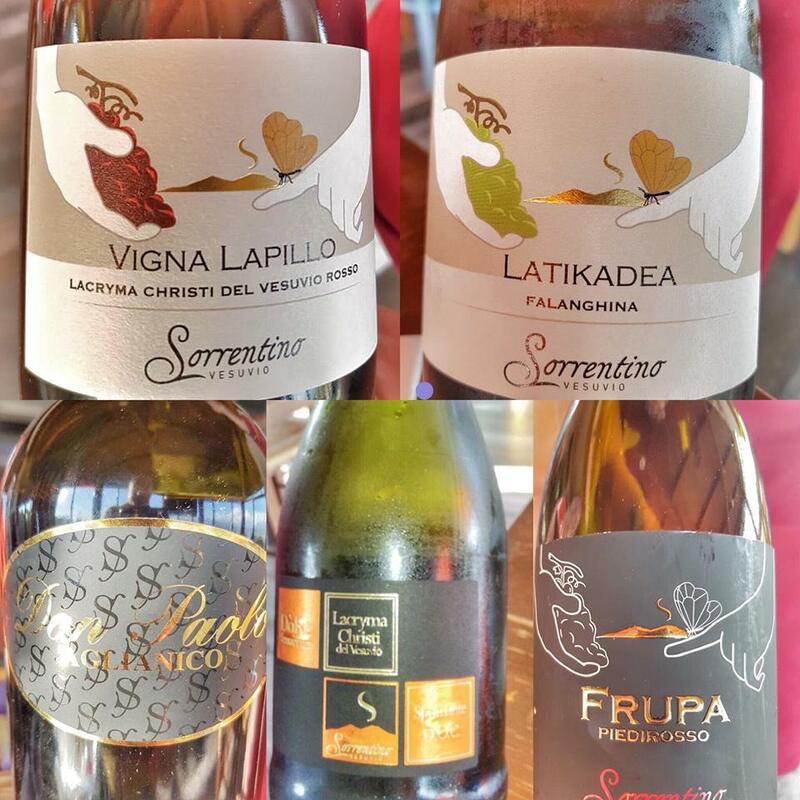 We tasted the Latikadea Falanghina 2014 (100% Falanghina) rich, citrus fruits, floral notes, pineapple, balanced Vigna Lapillo Lacryma Christi del Vesuvio Rosso DOC Superiore 2015 (Piedirosso 80%, Aglianico 20%) lovely, easy drinking with good acidity and soft tannins, went beautifully with the pasta, Frupa, 100% Piedirosso Superiore IGT 2013, dark fruit, velvety, Don Paolo 100% Aglianico Superiore IGT 2013, complex, with aromas of red fruits, but also peppery, coffee, liquorice and tobacco, ‘Fior di Ginestre’ Passito Vesuvio 2012 (Caprettone 70%, Falanghina and Catalanesca 30%), dessert wine with citrus fruits and more tropical notes, quince, good acidity. My overall impression of the winery and the wines was very positive. The wines had a sense of minerality which came through as salinity, not powerful but traceable, and good acidity. They had character, complexity and lovely length. All were wines I would happily recommend and drink. Nevertheless, I started thinking about how I would compare these to the wines of Santorini, as they are the volcanic wines that I know well. I have tried wines from Etna and Tenerife, but I didn’t feel I remember them well enough to make a comparison. I looked up the type of volcanic eruptions of Vesuvius and Thira. Vesuvius was Plinian and Thira Ultra-Plinian, so a similar type of eruption with a difference in the magnitude. They happened many years apart, the precursors were different and the soils are different. The soil on Santorini (Thira) is Basalt and Volcanic (aspa) and is rich in essential materials, but potassium is negligible. As far as I know, potassium is an acid moderator. If one combines this with the intense heat, intense winds, very low precipitation, one could hypothesize that all of these factors, together, play a role in the intense acidity of Santorini wines, in the intense minerality/salinity of the wines and in the rather ethereal aromas of both whites and reds. We all (?) agree that volcanic wines are more complex, with lighter aromas and a trademark minerality. It would be interesting for one to study how volcanic soils differ, (if they do), depending on the type of volcanic eruption, the minerals they contain, together with the climatic conditions, and how these affect the wines from the different volcanic sites. As I saw it, the wines I tried from the Vesuvius had common characteristics to the wines of Santorini, albeit in a lighter version. I have visited this winery many times while we were living in Naples. I appreciated your descriptive comments about the wine......we sadly have not found anything like this in Colorado! 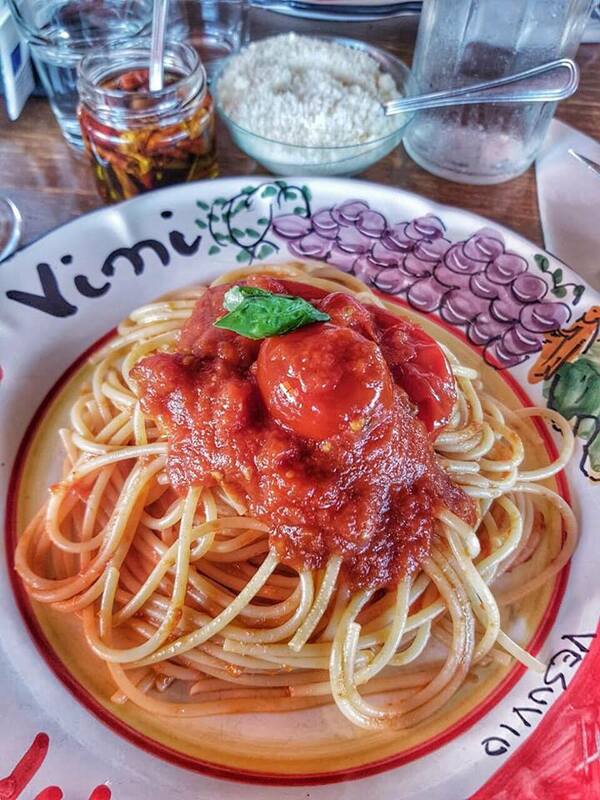 We also have fantastic dinners prepared by Elena and Maria Don Paolo. The story telling of Antonino and Mattia made for wonderful memories! !